A 7-2 lead in the sixth inning seemed safe. It appeared head coach Gregg Ritchie would go home with bragging rights over George Mason – the Orange Line and soon-to-be A-10 rival. Adding an extra edge for GW’s head coach? It’s the university that two of his children attend and the place where he almost committed to play college baseball instead of GW. But the five-run margin quickly evaporated into a 9-7 deficit after a three-run Patriots eighth inning earned George Mason its first lead of the game, along with some serious momentum. Undaunted, the Colonials came up with a four-run ninth inning, punctuated with a two out, three-run double by senior Tyler McCarthy. Senior Tyler McCarthy connects on a pitch earlier this season. He played a crucial role in GW’s ninth-inning rally over the Patriots Tuesday. The team’s efforts were not squandered Tuesday afternoon at George Mason, as it pulled off an 11-9 win. Ritchie used his entire bench to hold onto the win, led by two starters, juniors Owen Beightol and Brookes Townsend. Beightol went two-for-four with two runs scored and a home run. Townsend, the versatile second baseman, also went two-for-four with one run scored and one run batted in. 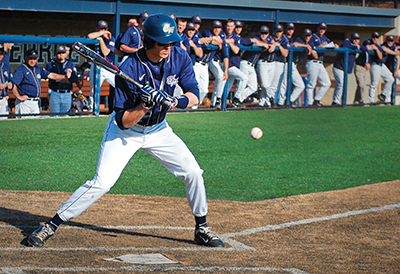 Towsend’s run, the first of GW’s four in the ninth, was a result of his 2-2 hit-by-pitch. Townsend proved to be GW’s crucial baserunner, and the Colonials continued to battle. But a strikeout left GW with two outs and a runner on first, down two. Then, an error, one of four for George Mason, in the next at-bat kept the line moving. Freshman Tyler Fairbanks had a huge single to keep the rally alive, loading up the bases for McCarthy, who doubled over the left fielder’s head, leading to a bases-clearing double and most importantly, the lead. Senior Matthew Murakami then added on an insurance run with a base hit back up the middle off a 3-2 pitch. The pitching was not as solid for the Colonials, though. Senior Brian Derner started the game but only lasted one and two thirds innings. Derner yielded one run but gave up four walks. Normally reliable, closer junior Craig Lejeune could not come in the eighth to stop the bleeding as he gave up one run on two hits, while putting no one away. Instead, freshman Bobby Lewarne came in to pitch and threw two innings of scoreless ball, only giving up one hit. “The beautiful thing about games like this is it gives other guys the opportunity to become better players. It gives them the opportunity to find the groove, get a little confidence, for guys like Fairbanks and Lewarne,” Ritchie said. Next, GW will host A-10 opponent Richmond, which sits at 3-3 in the conference. The Colonials will look to build off of the roller-coaster ride of a win over the Patriots, Ricthie said. “So although it’s a win, and it’s all about the W, we got to get to work on Wednesday and Thursday so we can go and compete really hard against Richmond,” Ritchie said. This article appeared in the April 4, 2013 issue of the Hatchet.